PLAYING NOW IN CINEMAS NEAR YOU BUT IF IT ISN'T CLICK HERE TO FIND OUT WHEN! So when this movie first started making the rounds it sounded interesting, then I remembered that there was a Futurama episode with the exact same story which appeared in the episode title Anthology of Interest II from Season 3 of the series which aired on January 6, 2002. 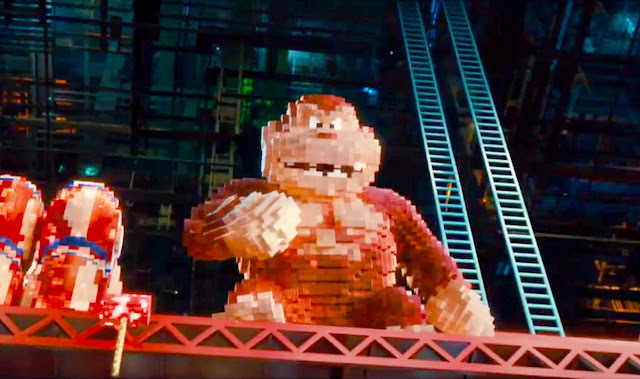 Also I just read that this movie was actually an adaptation of a short film by Patrick Jean also called Pixels which was released in 2010. So basically this movie is not at all original, all they've done is taken from these two and expanded it to include Adam Sandler, a bunch of his pals and a love interest. Basically think of any other Adam Sandler movie and mash it up with that episode from Futurama and Patrick Jean's Pixels, and there you go. 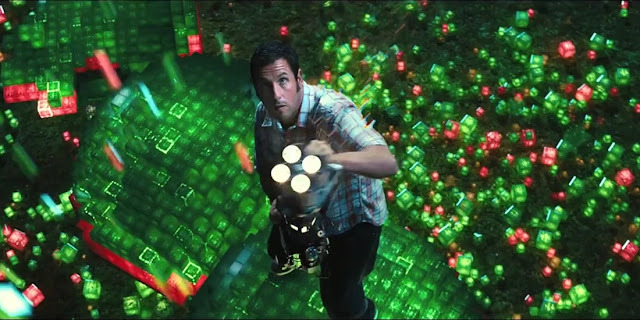 Also as with recent Adam Sandler movies expect the same everything too. Want to gauge what sort of humor you'll be getting? Kevin James plays his buddy Will Cooper who was his sidekick as a child but all grown up is the President of the United States. That's the sort of humor you can expect. So now you know that it isn't exactly original either in terms of the story or even in the visuals for it. And you know what kind of humor, what kind of jokes you'll be getting, so what's left? Very little else actually. OK SO BEFORE YOU CONTINUE AND IF YOU HAVEN'T SEEN THE MOVIE LET ME TELL YOU THAT FROM THIS POINT ON THERE WILL BE MORE SPOILERS. YOU HAVE BEEN WARNED! 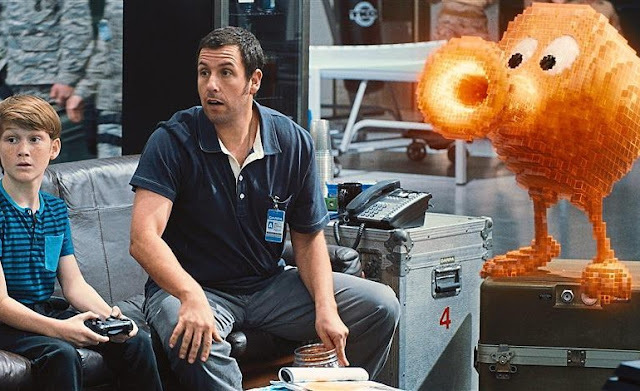 Sam Brenner (Adam Sandler) was supposed to be a champion arcade gamer but gets beaten at the last moment by Eddie Plant (Peter Dinklage) which destroys his confidence so much that he ends up a recently divorced adult who's day job is to install home entertainment systems at other peoples homes. His sidekick friend is now the nation's President who is himself in trouble at the popularity polls for being an ineffectual and somewhat dimwitted leader. They both find themselves in a position to change their fortunes as it were when earth is attacked by aliens who interpret a nasa recording of 80's arcade games as a threat to their existence and their answer to said threat is to emulate what they saw in those recordings to attack earth. When they do Mr President enlists Sam's help and another acquaintance named Ludlow Lamonsoff (Josh Gad) who is a conspiracy theorist who discovered the aliens hidden message to earth while recording a TV show. In between all the alien attacks and the nerds having to prove themselves to everyone else Sam falls for Lieutenant Colonel Violet van Patten (Michelle Monaghan) a military research scientist who helps develop the weapons used to fight the aliens. Also when things get tough they get Eddie Plant to help them. Later during the final epic fight with the aliens Sam discovers that Eddie cheated when he beat him all those years ago at the arcade championship which boosts his self-confidence and helps him beat the aliens. So how good can a movie that isn't all that original be? Not all that good. 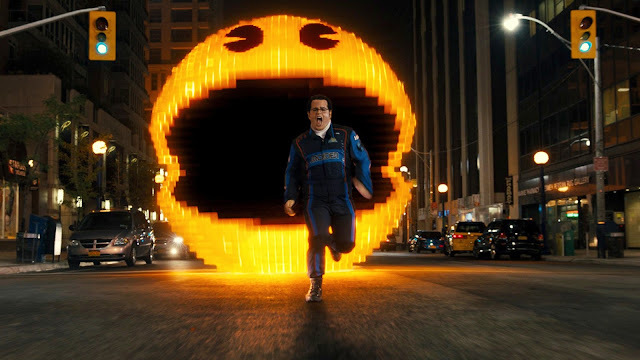 Pixels has been out a while now and I tend to agree with most of the reviews. This movie is mediocre fare. 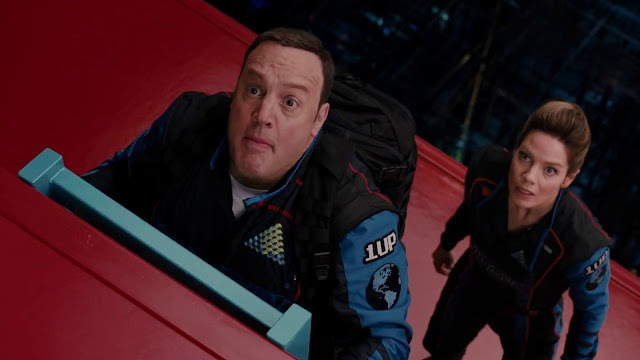 It's so much of the same that you get from any other Adam Sandler or Kevin James movie. You'll get a few chuckles, maybe a few laughs but you won't want to watch it again for a long while and even when you do it'll probably be because you were surfing through the channels and can't figure out want to watch and sort of settled with watching this one. It's that sort of movie. If anything this movie is just another of Adam Sandler's love of the 80's personified on film. The 80's music is there, the arcade games of course, the opening scene is Sam and Will back in the 80's visiting their towns first arcade store, there's even Josh Gad hamming it up on stage singing a song from the 80's and of course Peter Dinklage character is still stuck in the 80's mullet and all. 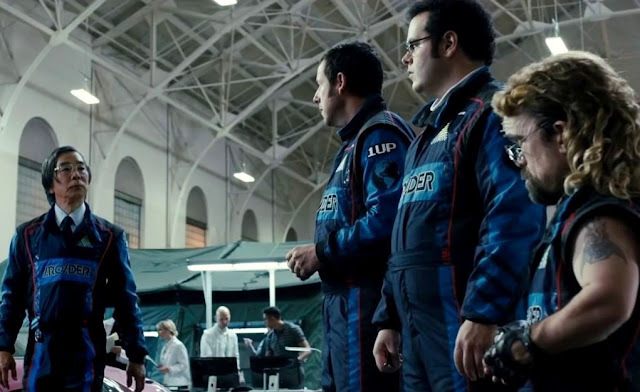 The story is predictable, the dialogue uninspired, the acting forgettable. The only fun things in this movie are the non-human characters. It was sort of fun and very cool to watch all those games from the 80's on the big screen. And the way they were visually designed to look real and yet still in all their pixellated 8-bit glory was really cool. But cool visuals don't make a good movie. 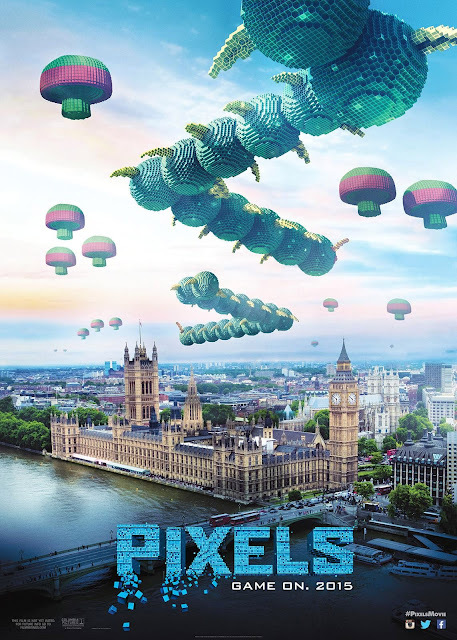 THANK YOU NUFFNANG AND SONY PICTURES MALAYSIA FOR THE #NNPremiereScreening PASSES TO WATCH PIXELS!! AND THANK YOU GSC CINEMAS @ 1 UTAMA FOR HOSTING US! !